With Nuance Dragon® Medical One, your staff can stay productive whether they’re at the workstation or anywhere else they need to be. Our clinical speech recognition provides a consistent experience at the hospital, clinic, office, home, and on the road. Dragon Medical One is all about portability, personalisation, access, insights, and compatibility. Portability to work at any workstation with the Dragon Medical One Desktop Application. Compatible with all leading EHRs, and designed with virtualisation in mind, the Dragon Medical One desktop app provides secure, accurate, and portable cloud-based clinical speech recognition across a wide range of Windows® devices. Dragon Medical One puts the power in the clinician’s hand with the ability to personalise their experience and gain access to new features, products, and services as they emerge. Flexibility to use your smartphone as a microphone – Nuance PowerMic Mobile. Insights abound with Dragon Medical Analytics. Dragon Medical Analytics gives system administrators access to individual and site-wide usage metrics and trends so they can optimise clinician efficiency, productivity, and workflows. With Dragon Medical Analytics, organisations can maximise their Nuance investments and make more informed decisions. Compliant HSCN certified Nuance cloud. Dragon Medical One is based on a healthcare compliant hosting infrastructure supporting the availability, business continuity, and security demands of the NHS. Put it all together, and it’s more than just a cloud platform—it’s a way to redefine the clinician’s relationship with technology. Dragon Pro Group or Dragon Pro Individual...which one suits your needs? We often get asked by our customers about the main feature/benefit differences between ‘Dragon Professional Group 15’ and ‘Dragon Professional Individual 15’ - we thought we’d put a simple 1 page guide together compare their specific feature sets. Download the PDF guide here and feel free to use our contact page to ask further questions. “Speech recognition technology across the NHS will be inevitable, but training is essential if its deployment is to be a success”, reasons Gary May, Managing Director, Freedom of Speech Ltd.
“I’m sure that many would agree that the pace at which speech recognition has evolved and been adopted over the last few years has been close to breath-taking. Combined with Artificial Intelligence, products like Dragon Medical Professional Edition is now even more accurate and easier to use. To many outside of the NHS, speech would seem to offer a realistic answer to some of the resource challenges it faces today, ranging from lack of staff, budgets and the rise in patient numbers and subsequent admin requirements. Indeed, across the country, pockets of the NHS then – from GP practices to some departments – are already using the technology to great effect. They’ve already seen how it can make a tangible reduction to patient letter turnaround times, or save them up to an hour a day on admin. For others, they have seen secretaries’ roles evolve from back office admin and back into front line patient care, which, arguably, is how staff resources should be used. Note that I said pockets of the NHS. And there-in lies a conundrum. Speech technology is clearly an effective and powerful tool, and one that can play a role in the NHS’s five year forward view. This begs the questions why the NHS hasn’t embarked on a broader deployment of the technology. From my experience meeting with clinicians and other healthcare professionals over many years, it boils down to two reasons. The first is to do with changing fixed mindsets - ‘I’ve always done it this way, and I’m sticking to it’. While I have some sympathy for that perspective, the sympathy evaporates when that way of working has the potential to cause unnecessary delays and complications relating to the most important matter of all – patient care. Often, the second reason is the lack of training – or poor training – that does little to shift this fixed mind set. It’s a dilemma compounded by the NHS’s legacy workflow processes; speech isn’t just about putting words on a page quickly, effortlessly and accurately. It’s about productivity driven by voice commands, too. If these aren’t integrated with existing workflow processes, there’s the danger that speech can frustrate users rather than satisfy them, and, when that happens, users will almost always revert back to ‘the old way of doing things’, thus scuppering any real chance of making tangible efficiency improvements. On a more positive note, we’re seeing much more enthusiasm for speech from a younger generation joining the medical profession and those that are comfortable using it day to day. Their positive consumer experiences of the technology sets the expectation that it will be available for them to use in a professional capacity as well, so the NHS needs to ensure that it is prepared for the new wave of clinicians entering the profession. Even then though, those that enthuse over the technology will need training. While the technology does ‘work out of the box’, getting the most from it will require some investment, tailored to each individual, to create a workflow process that is seamless and efficient. Nuance have relased an important new update to Dragon Professional Group - version 15.4. This update includes new features, bug fixes and other updates crucial to the smooth opreation of your speech recognition application. When you connect to Dragon through a Remote Desktop connection, the Automatically adjust the microphone level as I speak option that appears in the Choose a Microphone dialog box is now unavailable. This option enables or disables Automatic Gain Control, which is unnecessary when connected through Remote Desktop. Note: You can enable the option at any time. There is a new section in the Dragon Client Installation Guide on configuring Dragon and its environment securely. For more information, see chapter 2, "Preparing to install Dragon" in the Dragon Client Installation Guide. Dragon now supports Microsoft Office 2019. The following issues have been resolved in version 15.4. Automatic Gain Control (AGC) in virtual environments no longer causes deadlocks. Microsoft Outlook and Microsoft Word no longer fail in virtual environments when they are opened by macros, add-ons, or other third-party integrations. Issues in virtual environments where Full Text Control was not available when you launched Microsoft Office are now resolved. Other miscellaneous defects have been resolved. To update to version 15.4, you do not need to uninstall your previous version of Dragon before installing the new version. Version 15.4 is a service pack, where the installation process installs your new version automatically. Do the following to update Dragon. 1. Obtain the 15.4 service pack from your Nuance Network portal or contact Freedom of Speech Ltd directly. 2. Close any open programs. 3. If you’re running an anti-virus program, turn it off until the installation completes. 4. Double-click the DPG15DOT4VLA.exe file to run the installer. 5. Select your language when prompted, and then click OK.
7. When the update completes, click Finish. While installing Dragon on Windows Server 2008 R2 is still supported in version 15.4, support for this operating system will be deprecated in the next Dragon release. The minimum supported Windows Server version in the next Dragon release will be 2012 R2. 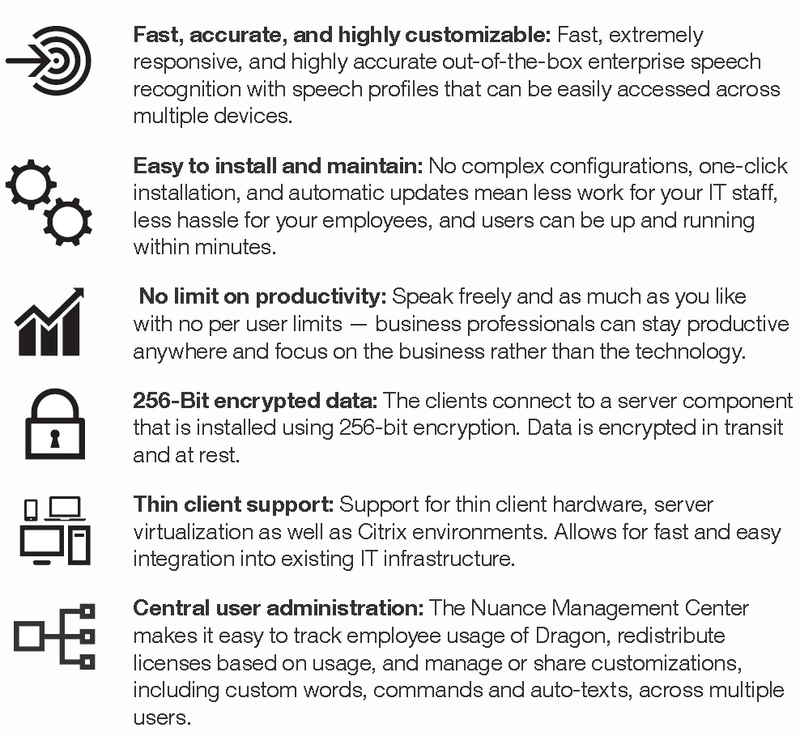 Nuance® Dragon® Professional Anywhere is an enterprise, on-premise speech recognition solution empowering business professionals to create high-quality documentation – all by voice. Enterprises can streamline repetitive and manual documentation processes, while saving time for IT staff and boosting productivity and efficiency for busy professionals across work teams and work groups. Highly scalable and ready-to-use, Dragon Professional Anywhere works across your existing infrastructure of Windows-based devices, including virtualized and remote-access PCs. The lightweight Windows client application downloads and installs in minutes, and provides an encrypted connection to your on-premise data center. It can be customized to include sector specific terms, phrases, and formatting rules that ensure a fast and accurate speech recognition experience. Additional features include customizable voice commands and auto-texts, navigation and voice-based correction. Dragon Professional Anywhere can be installed on Windows-based enterprise workstations or laptops in just minutes without the need for complex configurations. Once installed, front-line and back-office employees alike simply open the app from the Windows Start menu, place the cursor where they want speech-recognized text to appear, and start dictating into Windows-based applications (e.g., Microsoft Outlook, Microsoft Word). Ready to use, requires no speech profile training, includesaccent detection and automatic microphone calibration. Simplify IT’s job with a solution that’s easy to deploy, maintain and centrally manage. Built for teams. Built for the enterprise. Nuance offers flexible volume licensing programs—designed to help organizations realize improved productivity at an affordable price. 32-bit: Microsoft Windows 7, Windows 8.1 and Windows 10. Microsoft .NET Framework 4.5 (or higher) is required. For further information and pricing, please get in contact with us. Nuance’s latest version of Dragon Medical Practice Edition boasts a host of artificial intelligence features but what does this really mean for GPs and practice teams dealing with challenges of the here and now; increasing workload and a demand for improved healthcare outcomes. Here we decode the AI jargon and explain 5 reasons why the AI in the new version of this ever-popular clinical speech recognition software really matters. Nuance are the ONLY speech recognition vendor currently using AI inside their speech recognition engine. Their speech recognition is very powerful, fast and very accurate in fact it is the most advanced in the healthcare market and their ongoing commitment to R&D ensures that the investment you make in Dragon Medical Practice Edition today will last a very long time into the future. Nuance’s focus and investment in speech recognition R&D ensures their healthcare products incorporate the latest, most powerful and proven technology. Nuance keep abreast of developments in healthcare, adapting their software to meet its changing needs and making sure we stay ahead of competitors. Dragon Medical Practice Edition is designed with general practice needs in mind. It is easy to learn, easy to use, very fast and its accurate and reliable making you more productive more quickly. Contact us for more information about Dragon Medical Practice Edition. Nuance Communications, Inc. announced the release of Dragon Medical Practice Edition 4 on 22nd January 2018, the latest locally installed version of Nuance’s industry-leading clinical speech recognition solution for smaller practices. Through deep learning technology and sophisticated acoustic models, Dragon Medical Practice Edition 4 puts Nuance’s leading artificial intelligence (AI)-powered technology in the hands of busy clinicians in independent practices. Increased documentation efficiency allows for more time with patients, improved quality to better inform care teams and staff, decreased turnaround time and increased cost savings. We are committed to helping clinicians provide their best patient care and helping healthcare organizations improve the way they capture and communicate the patient story. Pricing for Dragon Medical Practice Edition 4 and confirmation of when we can start shipping this new version will follow shortly. For more information about Dragon Medical solutions for clinicians, please get in touch with us via our contact page.